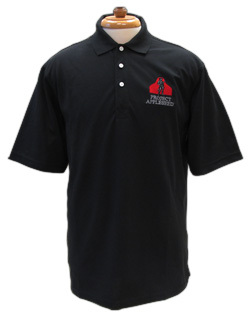 LIMITED INVENTORY REMAINS - Rapid Dry Appleseed Polo - available in black. LIMITED QUANTITIES - THIS VERSION OF THE INSTRUCTOR SHIRT IS BEING MADE AVAILABLE AT $10 EACH (NO COUPON REQUIRED, NO LIMIT ON QUANTITIES PURCHASED) UNTIL CURRENT STOCK IS GONE. 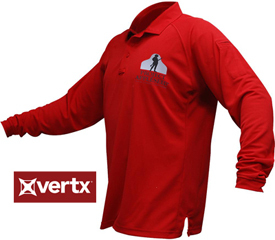 The Vertx® coldblack® Long Sleeve Polo allows you to stay cool while wearing dark colors in the sunlight. Exclusive coldblack® technology combined with moisture-wicking fabric reflects 80% of the sun’s uv rays and lessens heat absorption — resulting in a light, breathable shirt perfect for warm weather shoots. Appleseed logo printed on front left chest. INSTRUCTOR printed on back. 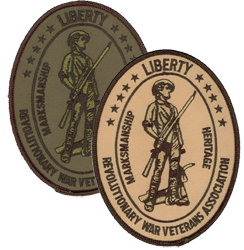 Rifleman Flag printed on right shoulder. Please include your forum name in the Ordering Instructions box at checkout. LIMITED QUANTITIES - THIS VERSION OF THE INSTRUCTOR SHIRT IS BEING MADE AVAILABLE AT $10 EACH (NO COUPON REQUIRED, NO LIMIT ON QUANTITIES PURCHASED) UNTIL CURRENT STOCK IS GONE. THIS SHIRT IS BEING REPLACED IN NEAR FUTURE WITH ONE THAT HAS APPLESEED FLAG LOGO ON FRONT RIGHT CHEST INSTEAD OF SLEEVE. XL SIZE NO LONGER AVAILABLE. 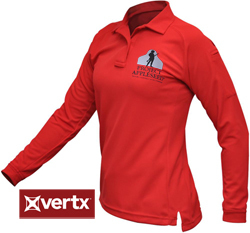 Stay cool when the temperature rises with the Vertx® women’s coldblack® polo. Available in long sleeves, our female-cut polo utilizes coldblack® fabric technology to reflect 80% of the sun’s rays, this preventing the absorption of heat common with dark colors. Advanced moisture-wicking help, non-roll collar and gusseted sides make this polo the perfect choice for warm weather events. 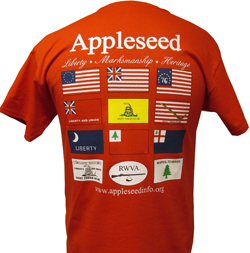 Appleseed logo printed on front left chest. INSTRUCTOR printed on back. 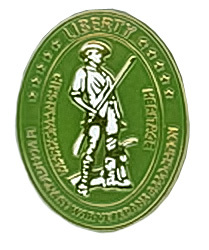 Rifleman Flag printed on right shoulder. These are the rockers that go with the oval patches. 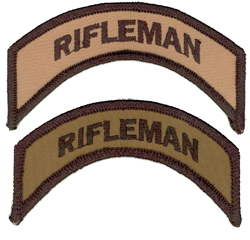 Rifleman Rockers are for those who have shoot and received their Rifleman patch.